Stocks slipped lower in morning trade before reversing to big gains before the close. The market’s choppy behavior continues to leave investors concerned with the volatility and what’s to come next. Let’s look at some top stock trades for Friday. JPMorgan (NYSE:JPM) is up on Thursday after it was revealed that Warren Buffett’s Berkshire Hathaway (NYSE:BRK.A, NYSE:BRK.B) took a ~$4 billion stake in the company and upped his investments in multiple bank holdings. 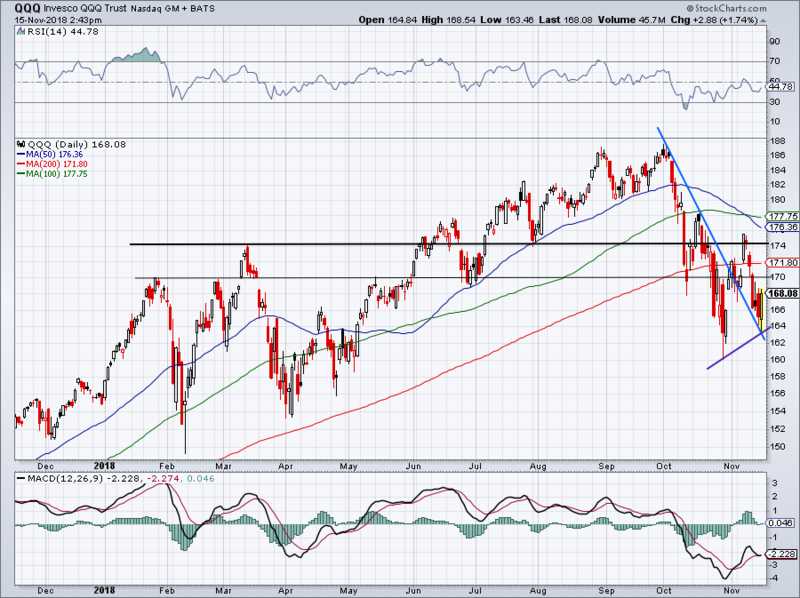 Support in the low-$100s remains imperfect but effective. Meaning that JPM looks dicey at times, but its sizable buyback and dividend along with its low valuation continue to buoy the stock in this area. 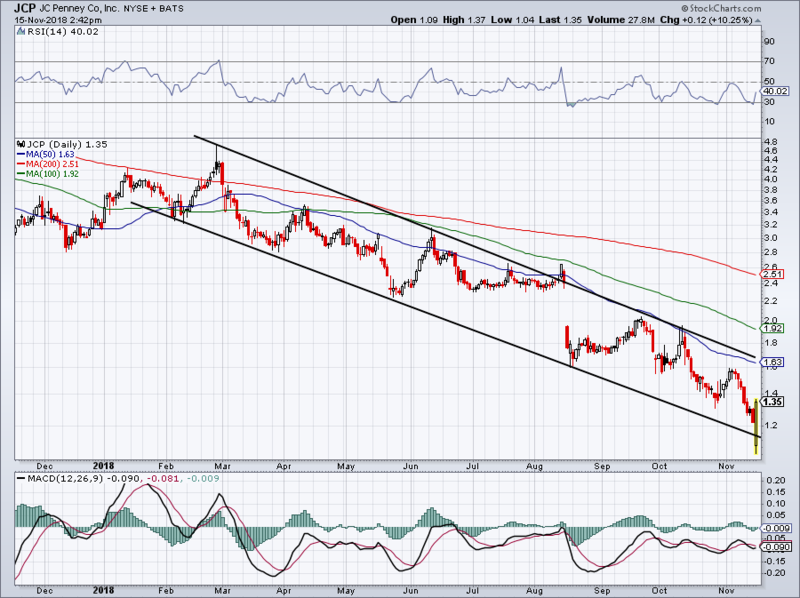 Earlier this month we said shares would likely hit downtrend resistance near $112 and that played out well. We’ve now got a higher low in place, as JPM attempts to push higher. If the market doesn’t cooperate, it won’t work for bulls. In fact, it could even set up well for bears, particularly with all three major moving averages between $110.50 and $111.25, and downtrend resistance just ahead. Above $112 and JPM can move higher. On a decline, watch the $107 lows. After hitting its lowest levels ever, J.C. Penney (NYSE:JCP) is on the move, rallying 15%. Is it short-covering or legitimate buying? I don’t know or care. I have been long avoiding JCP and that thesis won’t change anytime soon. This one does not have solid footing and I’d be surprised if it got back above $1.75. That’s not to say it can’t, but I just don’t have faith in this one. Maybe it rallies 40%, but it’ll do so without me. I’d rather invest in companies with stronger financials. 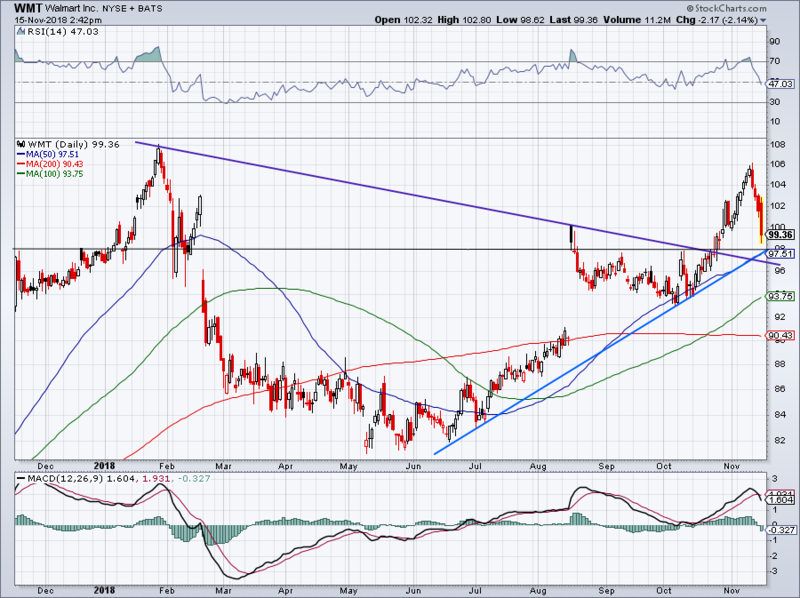 Walmart (NYSE:WMT) peaked out near $106 and has been under pressure the past few days. Despite an earnings beat Thursday, it couldn’t reverse its recent misfortune. I would really like a stab at this name around $97 or $98. It’s got the 50-day moving average, uptrend support (blue line), the backside of downtrend resistance (purple line) and level support (black line) all congregating in the area. That seems like a worthwhile risk to me. The sudden reversal in the PowerShares Nasdaq ETF (NASDAQ:QQQ) has given hope to a lot of bulls, but we need to see some definitive follow through. When the market finally does decide to go higher, there will be plenty of time to get on board. As of now though, we’ve put in a higher low, which is constructive, as well as held the backside of prior short-term downtrend resistance (blue line). $170 was previously a big level to my eye, but it doesn’t seem like it’s been too relevant during this corrective phase. I’d be curious to see how the QQQ does on a rally to the $172 to $174 area, where it’ll hit the 200-day and possible resistance. On the downside, it’d be good for bulls to hold short-term uptrend support (purple line). The ETF’s performance will largely depend on Apple (NASDAQ:AAPL), Microsoft (NASDAQ:MSFT), Amazon (NASDAQ:AMZN), Alphabet NASDAQ:GOOGL, NASDAQ:GOOG) and Facebook (NASDAQ:FB) — its top-five holdings. This is a name I really like. Minus it tumbling lower in the first few weeks of October, PayPal (NASDAQ:PYPL) continues to trade relatively well. Further, the company recently reported solid earnings results. With Thursday’s impressive 3% rally, shares are now back above all three major moving averages and are just a few dollars away from the monthly highs. If momentum can continue, a move to $90 seems reasonable. 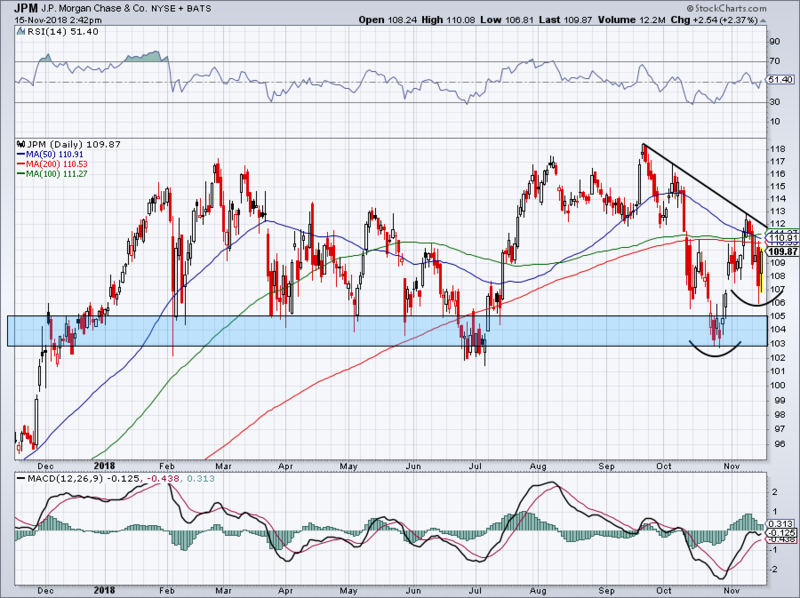 If the market cooperates, it feels like PayPal wants to return to its prior highs. 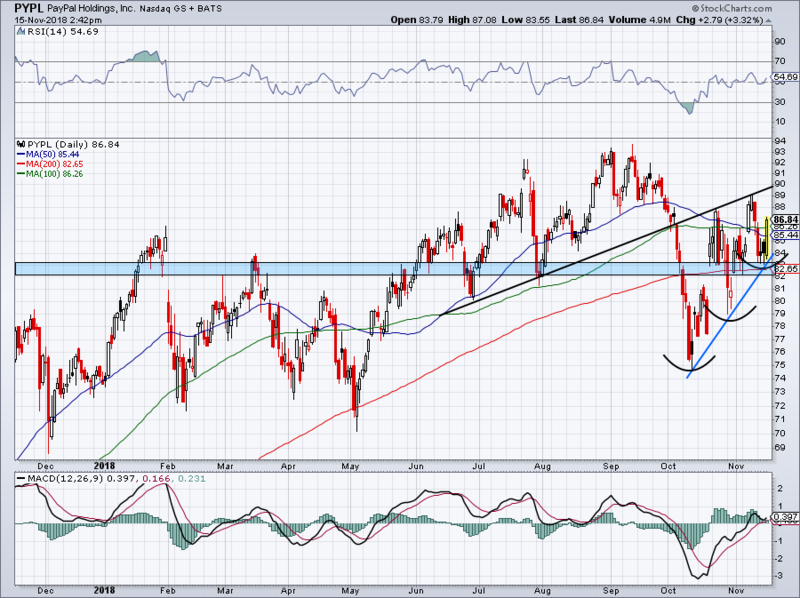 The stock continues to put in a series of higher lows, a constructive bullish pattern. Bulls can consider stopping out on a close below the 200-day moving average. Bret Kenwell is the manager and author of Future Blue Chips and is on Twitter @BretKenwell. As of this writing, Bret Kenwell is long AAPL, AMZN, GOOGL, JPM and PYPL. Article printed from InvestorPlace Media, https://investorplace.com/2018/11/top-stock-trades-jpm-jcp-wmt-qqq-pypl/.